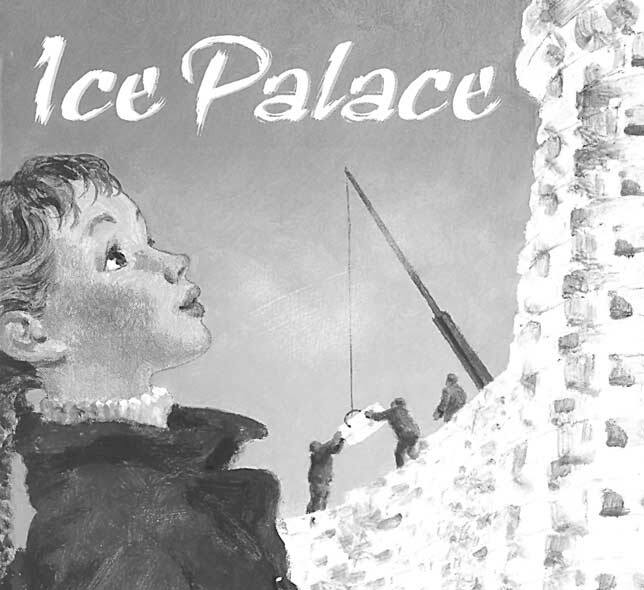 If you’re interested in reliving days gone by in the cozy mountain village of Saranac Lake, while gaining an insight into the magical centerpiece of the nation’s oldest winter carnival, the newly published children’s book Ice Palace should delight you and your children. It seems the perfect bedtime story for a winter’s evening, with frost on the window and snow falling outside. Through the eyes of a young girl, author Deborah Blumenthal tells the story of a fantasy come to life, a palace built of big blocks of ice (weighing up to 800 pounds apiece) by real people in a community that really exists. 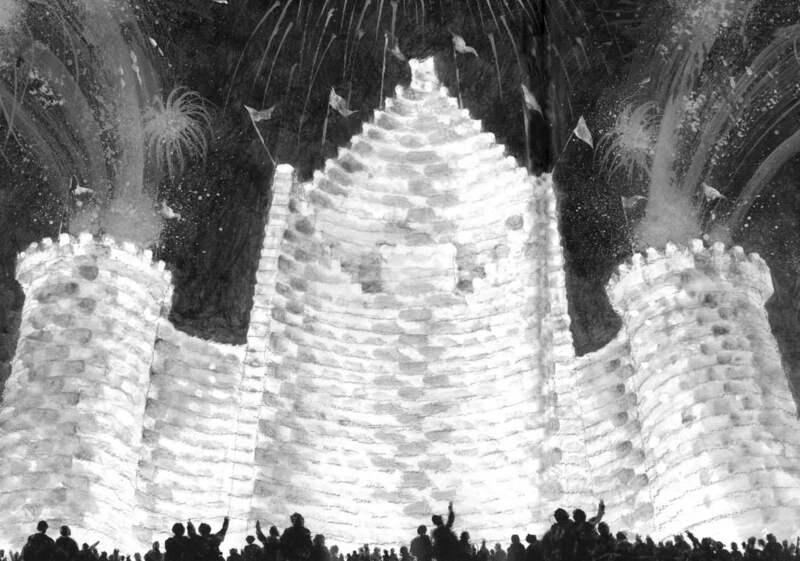 The book captures the vitality and enthusiasm of the creative process that goes into constructing the palace, thanks in large part to the inventive compositions by illustrator Ted Rand, who used visual references supplied by Saranac Lake photographer Mark Kurtz. Being an artist myself, I stand in admiration of the way the pictures help enliven this well-told tale. The illustrations shift from an intimate cafe scene, where the design for the latest ice palace is being sketched out on paper napkins by a merry group of villagers, to hard-working volunteers cutting the ice out of Lake Flower, all seen from the vantage point of a young child. Rand artfully gives a nod to the past with an elegant monotone, blue-gray rendering of men cutting and hauling away blocks of ice using the hand implements of a earlier era. He also uses bird’s-eye views that convey the sense of excitement and joy of the moment. 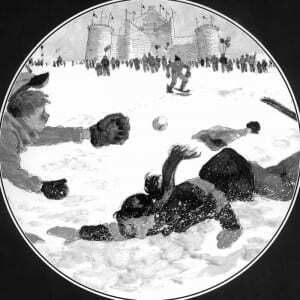 Throughout the story, the author balances the fanciful with “real life” experiences, such as the bitter cold (“when wind blows as fierce as the bite of an Adirondack black bear”) and the assistance of officers and inmates from a state prison in nearby Gabriels. The workers become personalized through the character of an inmate named Mike, the uncle of the young girl who is the central character and voice of the story. Having previously taught art in three correctional facilities, I found this element of the story to ring very true—the idea that setting a goal, planning and using teamwork for a positive result can have a lasting effect on a person in prison. At the end of the book, the girl wonders if Uncle Mike will come to see the ice palace when he is released. In fact, some former inmates do return to celebrate our winter carnival and the ice palace that provided them with a sense of accomplishment and worth at a difficult time in their lives. So this little girl’s musing may be more than just wishful thinking. 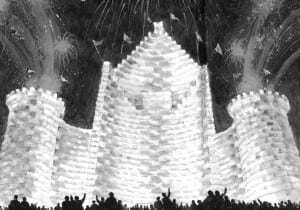 I am a native of Saranac Lake who had the privilege of living across the street from the many ice palaces constructed during my childhood. It is gratifying to see that this story has been charmingly presented and that it is factually accurate. The one thing I might correct, however, is the author’s note where she indicates that Saranac Lake’s record-low temperature is 35 degrees below zero. Having experienced 50 below on a number of occasions, I called local meteorologist Bob Kampf. Since 1959, when he started compiling such data, the lowest temperature he recorded (without wind chill I might add) was minus 41. I can tell you that before 1959 it got colder than that. This information is important because we residents take great pride not only in our ice palace but also, at least once or twice every winter, in being singled out as the coldest town in the United States outside Alaska. It has become a badge of honor for those of us who have survived!